A single-storey or double-storey extension could provide the extra space your looking for without the hassle of moving house. Renovate Building and Maintenance can complete your build from start to finish, working with architects, structural engineers and local building control authorities in order to provide a seamless project. 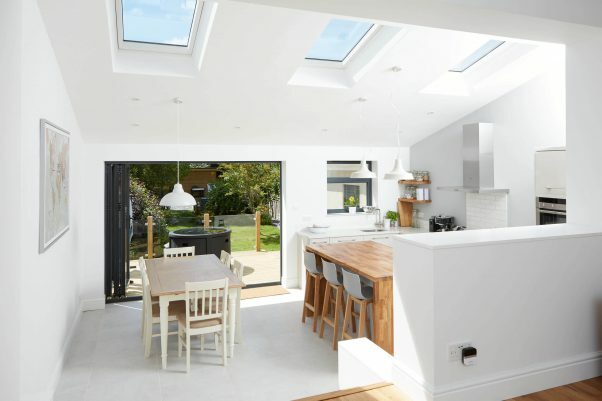 Double-storey extensions will always require planning permission, but some single-storey house extensions can avoid this process all together due to permissions being slightly relaxed in recent years. Your architect should be able to provide you guidance, but you can also find out if you need to obtain planning permissions. Once you have your design and obtained any necessary planning permissions, Renovate can provide you with a quote for the building and renovation work. Meet client onsite to view the property and design. Provide a detailed quote for work to be carried out, with a potential start date. Confirm start date once quote accepted. Commence work involving local building control and structural engineers where necessary. Throughout the work we will maintain communication to ensure a good working relationship between the client and Renovate. Payments will be invoiced for and taken at stages throughout the job. On completion of job: final payment arrangements made and building control instructed for sign off. Certificates provided of work carried out to the client. House extensions can range from a functional lean-to to a jaw-dropping bespoke design. We are able to take any build on at Renovate and we enjoy helping customers turn their house into their dream home. Alternatively, find out about our loft extensions.